The Love & Sleep mattress by Nest Bedding® is one of the lower priced direct-to-consumer mattresses. What kind of quality do you get for such a price? That’s something I’ll explore in this review, along with things like how the mattress feels and comparisons with other mattresses such as Tuft & Needle®. The Medium uses 5 inches of comfort layers on the top followed by a 6 inch support layer for a total of 11 inches thick. 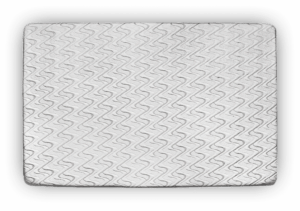 The top layer uses a “phase change material” which keeps the mattress a more neutral temperature (basically, as heat goes into or out of the material, it changes phase, for example from a liquid to a solid and back, rather than increasing temperature). Below that is a 3 inch layer of foam called “Energex”, which is a foam designed to be bouncier than memory foam, a little more like latex (but not quite as bouncy). Then, there is a 1 inch layer of “convoluted foam” (meaning egg-crate-shaped). The bottom layer is 1.8 pound density high resiliency foam, which is pretty standard (though competitors at this price point may go down to a weaker foam. This is a base layer many mattresses twice the price will use). The Luxury Firm version is a little simpler and uses less comfort foam. The top layer is the same, then it uses 2 inches of the Energex foam instead of the 3 inches the Medium uses. It skips the convoluted foam layer, and goes right to a thicker layer of the support foam. This is so that you won’t sink as far into the mattress. Overall, both of these mattresses are very well-constructed for the price. These aren’t luxury mattresses, but given the price they’re a great value. I was sent a Medium for review, so I can only comment directly on the firmness of that one, but between that and the materials used, I can still comment on the Luxury Firm version. The Medium is not what I would consider directly in the center of the firmness spectrum. It’s roughly the same firmness as what a lot of other brands might call “luxury firm.” When I lay on my stomach or back, I don’t sag into the mattress in my midsection, despite the fact that I am about 50 pounds overweight. When I’m on my side, it contours around my shoulder enough such that I don’t feel pressure (which is unsurprising, since it has 5 inches of comfort foam). I would expect the Medium to be firm enough for most people, so if you’re not sure which firmness to get, just get Medium. I’d consider that the default. The Luxury Firm version uses the same foams, just not as much of them, in the top layer. For this reason, I would not recommend it for a side sleeper. If you’re overweight and a back or stomach sleeper only (or if you generally prefer a firm mattress), the Luxury Firm is probably better. But for most people, I recommend the Medium. 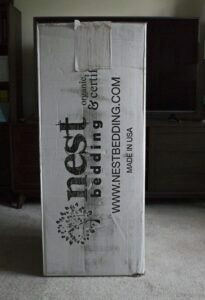 The Love & Sleep is one of the lower priced mattresses-in-a-box out there. It is only $599 in a queen. (The twin is $399, full is $549, and king is $749). Most competing mattresses are in the 800-1000 dollar range in a queen. Many of those other mattresses will be slightly better than the Love & Sleep, but it is not a big difference. It’s impossible for me to tell you whether it’s worth the money to spend on one of the other better quality mattresses. If money is tight, and you’ll be put under a lot of pressure to spend $900 on a mattress, then by all means, the Love & Sleep will do just fine. It’s a good mattress. On the other hand, if you won’t feel the difference at all in your bank account, I’d recommend getting a better mattress. In between those two extremes, it all comes down to how comfortable you are spending money. It doesn’t matter how well your mattress works if you can’t sleep at night because of your budget. One thing to note: the price is for the mattress only. If you need a boxspring and frame, or platform bed, or even an adjustable base, that will be extra. (Though, if you have enough money to afford an adjustable base, I’d recommend putting that money into the mattress instead.) Luckily, Nest Bedding has options for foundations (here is the link), so you can make it a one-stop shop. One last thing about the price: If you’re spending more than $1000 at Nest (whether it’s because you’re buying two mattresses, or you’re getting some accessories from them, like a mattress protector or pillow), use the coupon code NERD100 to get $100 off your order. The Love & Sleep has a 100 day return policy and a lifetime year warranty. The return policy means if you don’t like how the mattress feels within the first 100 days, you can return it for a full refund or exchange it for another model. This means there is very little risk to buying the mattress without trying it in a store first. The lifetime year warranty states that if the mattress sags more than an inch, or has any other manufacturing defects, they’ll repair or replace it for free. I’ll note that a lifetime warranty is fairly unusual in the mattress industry, and it shows that they’re confident in the strength of their product. But I should also caution you that it does not mean you can expect the mattress to be comfortable for the rest of your life. Given the materials it’s using, I’d expect you to get a good 6-7+ years of comfort life out of the mattress. Beyond that, even though there is nothing structurally wrong with the mattress, it just won’t be quite as comfortable, and you should look to replace it. There are dozens of direct-to-consumer mattress companies out there, and I don’t have the time or patience to list them all, so here is how Love & Sleep compares to a couple of them. It’s the Battle of the Ampersands! Tuft & Needle only comes in one firmness, comparable to the Luxury Firm version of the Love & Sleep, so you have an additional comfort option with the Love & Sleep. So if you want a really firm mattress, either is fine. Otherwise, the Love & Sleep has a plush option. The Alexander Signature is the “signature” mattress that Nest Bedding sells. It uses higher quality materials than the Love & Sleep, and it is more expensive as a result. Whether it is worth it to you is entirely up to your budget. If you have the money, the Alexander Signature is a better mattress. If money is tight, or you plan to upgrade the mattress in a few years, or if you’re in a college dorm, etc, the Love & Sleep is probably the better way to go. And this is how it looks just minutes after opening it. The Love & Sleep is one of the best mattresses in its price range ($599 in a queen). 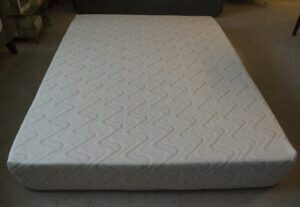 There are better mattresses out there, but it’s tough to find one under $700 in a queen that competes. For most people, the Medium firmness will be the best. The Firm version is only for people who like their mattress much more on the firmer side. If you like a really soft mattress, there isn’t a Love & Sleep model for you. Click here to buy a Love & Sleep. If you purchase more than $1000 worth of stuff (i.e. if you add in accessories like one of their Easy Breather pillows, an adjustable base, a second mattress, etc), use coupon code NERD100 for $100 off. Should you buy a mattress online or in store? High resiliency foam isn't memory foam. They're different formulations of foam. The Leesa also uses 1.8 pound HR foam in the base layer, just like the Love & Sleep. Hi! 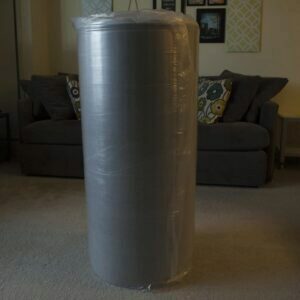 Based on your reviews, I bought a Leesa for my guest bed, using your discount code. Now I'm looking to replace our master bedroom bed, and revisiting the options since there are so many direct-to-consumer options popping up. I'm a little confused about the base layer. In the Leesa review, you said, "The memory foam layer is 3.0 pound density, which is the minimum I’d recommend for every night use. A lot of cheap Chinese foam mattresses you’ll find only use 2.5 pound, which is just not durable enough for every night use. More expensive mattresses tend to use 3.5 pound and up." But in this review, you say, "The bottom layer is 1.8 pound density high resiliency foam, which is pretty standard (though competitors at this price point may go down to a weaker foam. This is a base layer many mattresses twice the price will use)." Can you explain for me? Thanks so much. I really appreciate all of the information and education. The Tuft and Needle will be firmer than the Medium Love & Sleep. Between the medium Love and Sleep and the current iteration of Tuft and Needle, which one do you think is firmer? They're very similar mattresses. It looks like Tuft & Needle rolled back their price increase, so it's a fine option at the current price of $575 in a queen. Besides firmness options, do you have any other opinions about the differences between Love and Sleep vs Tuft and Needle? I'm looking for a mattress and I was leaning towards Tuft & Needle because me and my partner both trend towards firmer mattresses. Stumbled across Love and Sleep during the research process and am hesitant only in lack of costumer reviews but your review of Love and Sleep has me now torn! Any input would be great! Thanks for all the good work. It is a nice blog.